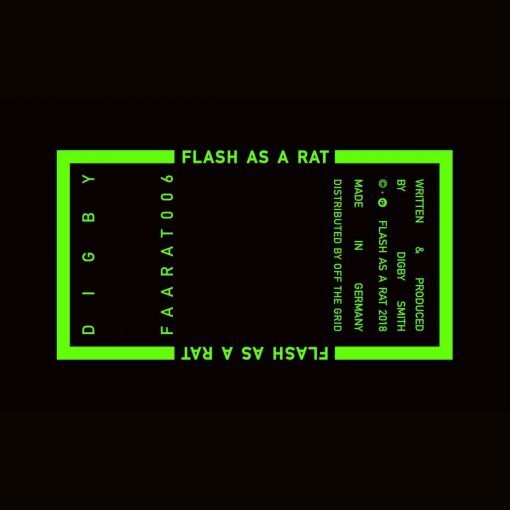 One year on from the passing of label co-founder and artist Alex Smith, Flash as a Rat returns with its 6th instalment. Digby, co-founder and brother to Alex, continues the siblings’ form for emotionally intelligent and sound focussed minimal. ‘Briefmacken’ bumps through waves of kicks and glitches to arrive at moments of peaceful clarity, whilst ‘Constantly’ swings with off kilter hisses and pops around a metallic organ sequence, making it’s claustrophobic way towards a beautifully layered string section at the crescendo. The typically pared back artwork this time inverts the colour scheme from the brothers’ first ever release on their own label, marking the record simultaneously the ending of one chapter and the beginning of the next. More items from " Flash As a Rat "
More items from " Digby "